VIDEO: Is Stephen Harper’s “tax lock” inspired by a Saturday Night Live skit? Where did Stephen Harper get such an idea? One possibility is a 15-year old Saturday Night Live skit. Conservative leader Stephen Harper pledged Friday to introduce a so-called “tax lock” that would ban any future increases to Employment Insurance and the Canadian Pension Plan. And to underline how serious he is, Harper even took a key and locked a box! Where did Stephen Harper get such an idea? During a 2000 Presidential election debate Al Gore (the real Al Gore) said “I will keep Social Security in a lockbox,” which he later described as an “iron clad lockbox” to prevent George W. Bush from raiding the “lockbox” and “squander” the surplus on tax giveaways. Like Bush, Harper has also raided the “lockbox,” using a $2.7 billion surplus in Employment Insurance to balance the budget after spending billions on tax breaks for wealthy Canadians. 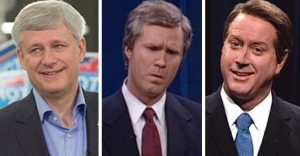 VIDEO: Is Stephen Harper's "tax lock" inspired by a Saturday Night Live skit? A 27-year old Conservative candidate whose job since graduating university has been working as employment minister Pierre Poilievre’s assistant says his solution to Canada’s youth unemployment problem is convincing more young people to take up volunteering to gain experience. 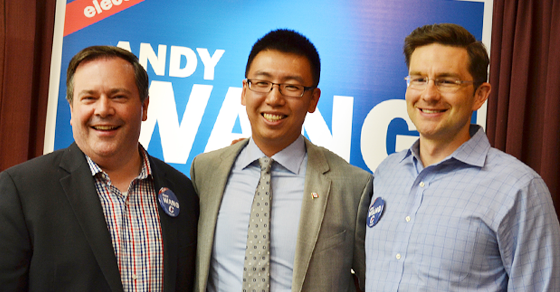 Andy Wang, the Conservative candidate for the Ottawa-area riding of Nepean was responding to a question about “student debt, high education prices and youth unemployment” at a local all candidates debate last week.